Go to Control Panel, Sounds and Audio Devices. Select Voice tab. Click 'Test hardware' button. Follow the steps on screen. In the Sound and Audio Devices control panel, go back to the first tab 'Volume'. Click the 'Advanced...' button in the 'Device volume' box. By default, Mic volume is not shown. Go to menu Options > Properties. 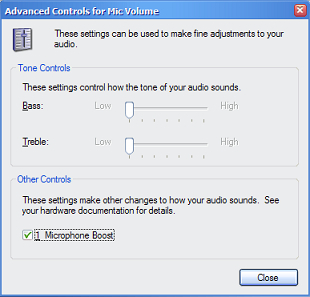 Tick 'Mic volume' then click OK.
Go to menu Options > Advanced Controls to show 'Advanced' button below 'Mic volume'. Tick 'Microphone Boost' then 'Close'. In normal case, you should be able to hear your mic working by now. However, I'm not that lucky. I hear a very high pitch sound coming from the computer speaker once I click on the 'Microphone Boost'. I had to instantly untick it to keep my ear working. Search in the web did not help. I'm certainly not expert in this but finally I don't get the high pitch sound after I reduce bass volume of the speaker. Then, retested the mic. Installed Skype. Done! i try your second solution and my mic. volume is up but i hear creaking sounds… what can i do?